I am making a 2D tile map based putt-putt game. I have collision detection working between the ball and the walls of the map, although when the ball collides at the meeting point between 2 tiles I offset it by 0.5 so that it doesn't get stuck in the wall. This aint a huge issue though. This is where things have gotten messy. 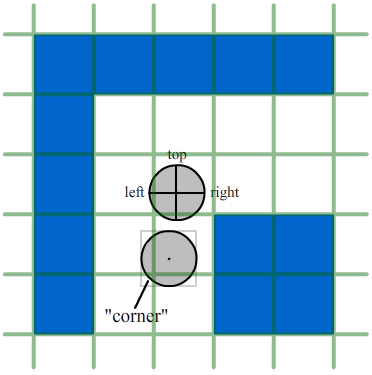 Collisions with 'floating' corners work fine, but now when the ball collides near the meeting point of 2 tiles, it detects a corner collision and does not rebound as expected. I'm a bit in over my head at this point. I guess I'm wondering if I'm going about making this sort of game in the right way. Is a 2d tile map the way to go? If so, is there a problem with my collision logic and where am I going wrong? Any advice/feedback would be great. First of your problem is that you're not looking in a further perspective. The ball blocks itself on a wall - just move it 0.5 pixels away. Why not try to unblock it instead? Later you treat a corner like a circle (do you mean a point? If not, I don't understand the idea and it makes me dizzy when I try). additionally squares are tiles, that is, you have a grid. Therefore our ball takes usually one, but sometimes up to 4 cells as the lower ball on the picture. We first treat the ball as a cross. If we want the collision to be pixel-perfect, then we can't treat the ball as a square, because sometimes where square would take fourth cell with it's corner, a circle doesn't reach. 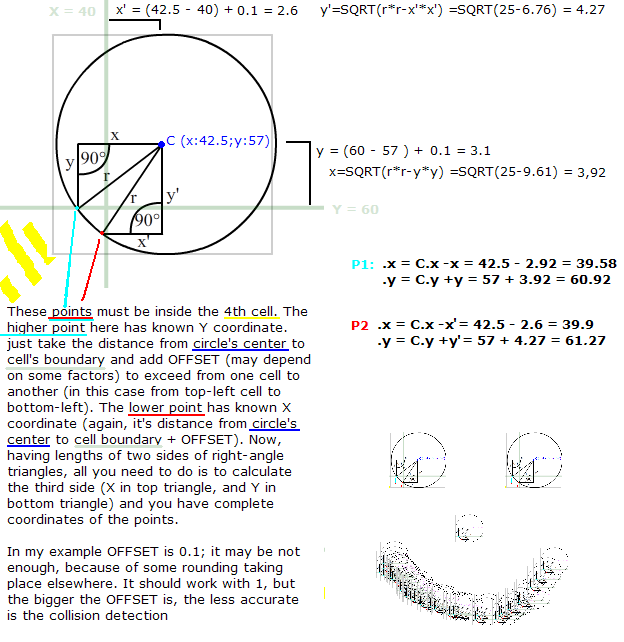 On example picture, top ball treated as a square would take a cell on left and down from it, while it shouldn't. * assuming the ball is not bigger then tile/cell. //it is possible that all below operations assign true to same tile! You should substitute '20' literals with some CELL_WIDTH constant. Keep in mind this could be optimized a lot, but I didn't want e.g. mess with minus signs, because the equations would be a lot less readable if I did. Get a list of nearby rectangles. If you collide with the red rectangle, move the green rectangle outside of it's boundaries (is very easy with rectangles) - in the way where it came from (vector opposite to original movement vector). If you moved player Rectangle, go to point 2. and check for collisions again. If you want playerRectangle not to lose full momentum when hitting a wall, you can update it's vx and vy by smoothEffectX and smoothEffectY and repeat. The code not tested nor optimized, but still is fast and should show you the idea. function sameSign ():Boolean //is playerRectangle's vx and vy both negative or both positive? Well, it's even harder. not much, if you understand that you define a square by 4 lines: x1=square.x; x2=square.x+square.width; y1=square.y; y2=square.y+square.width; And a rotated square by also 4 lines: x1=square.x+cosinus(square.angle)*y; x2=square.x+cosinus(square.angle)+square.width; etc. Not the answer you're looking for? Browse other questions tagged java collision-detection tilemap collision-resolution or ask your own question. How do I handle specific tile/object collisions?